It's a busy time of the year! However, the Spring 2014 semester is just around the corner and many of you may be preparing your course syllabi. For helpful tips on preparing your course syllabi, please refer to the Teaching Excellence Handbook and HB 2504. Remember that all course syllabi must be uploaded to the Faculty Profile System by January 20, 2014. 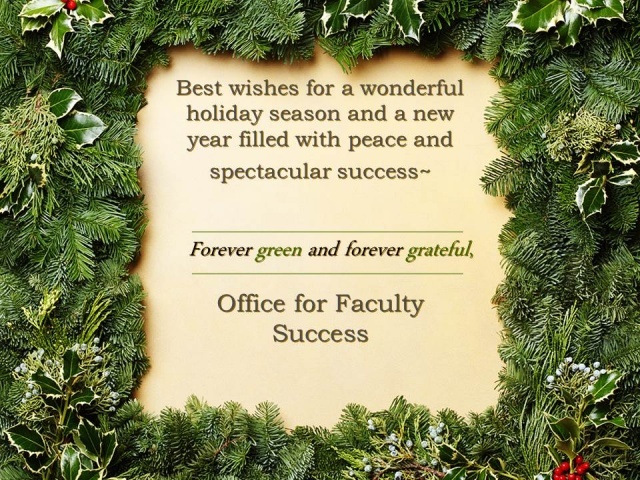 Please send your good ideas, comments and/or suggestions for the next edition of the Faculty Success Newsletter to faculty.success@unt.edu. Don't forget to check out the Faculty Success website to learn more about upcoming events, important deadlines, faculty spotlights, and professional development opportunities.